When Texans speak of spring wildflowers they usually mean Bluebonnets. And the only bluebonnet that grows abundantly here in the Trans-Pecos is the Chisos Bluebonnet, Lupinus havardii. This bluebonnet occupies a very narrow range along the corridor of the Rio Grande in the Big Bend. But here, it’s the champion bluebonnet and provides the majority of our spring color. Lupinus havardii plants are the tallest of all bluebonnets. Here is a photo of me, taken in the 80s, standing next to a group of this species. As you can see, they are tall; sometimes three or four feet tall! Lupinus havardii flowers are usually a deep blue/purple color. Now and then you may spot a white one, in which case it is your duty to tell all your friends just where you saw it. Visitors sometimes wear narrow paths from the road to an area where a white bluebonnet lives. Lupinus havardii has genes that enable it to create blue, yellow, red, and white. The deep blue/purple flower is the most common and the only color you’re likely to see unless you go hunting for different ones. But this year plants with different colors are occurring more frequently than usual, so I thought I’d share a few pictures of these varieties. I’ve not yet found a pink one, but I know they’re out there, and I’ll certainly keep looking. Here is your basic bluebonnet. The backlighting reveals the arrangement of pigments. The red and yellow patches are quite visible on this blossom. And here is a stand of a lighter shade. Here is the much less common white bluebonnet. A stand of blue and white bluebonnets living in the same area. I’ve heard that a single plant may create a multicolored raceme, and the usual deep blue racemes on different stalks, but that is another one I have not found yet. Here is a typical scene on the River Road in the national park. I hope you can come out to see this bloom, but from what I understand, Central Texas is just as spectacular. Texas is a great place this time of year. Winter is Big Bend’s most popular season – our cool, sunny winter days draw visitors from all walks of life – tourists, hikers, campers, naturalists, and sports lovers. Photographers love it too – though there are few blossoms and the winter palette is composed mostly of earth tones, the grand skies and landscape are still present and great photographs can be found almost everywhere you look. Here are some ideas to help you get the best pictures possible during your visit. No matter what your skill level or quality of equipment, there’s nothing you can do that will enhance your experience of a park more and net you better pictures than getting out of the car and walking. You needn’t go on great hikes – beautiful pictures are often only a few car-lengths away. This beautiful scene is about 100 yards off the main road in Big Bend National Park. This canyon is less than 100 yards from the main road in the Big Bend National Park. Small drainages may rapidly grow into larger canyons in these areas. Movie makers and professional photographers often spend a lot of time “scouting locations.” They’re doing just what you’re doing during your little mini-hikes; the only difference is that they’re also thinking about the pictures they would like to take there, and at what times of the day the pictures will look the best. You can do the same thing – pay attention to the sun and how the shadows lie. Try to imagine how the sun will traverse the sky and what will happen to the scene you see now during the course of the day. Then make notes and come back later to verify your guesses. If you were right, take the picture and congratulate yourself on having “scouted” a great location. If you find you’re getting hooked on taking great pictures, it’s time to take the next step – finding locations in advance. For this you will need maps and a compass. If you’re interested in plants or wildlife, look for springs and green areas you think you can walk to. These isolated watering spots are great places to find plants and wildlife of all kinds. If you’re mostly interested in landscapes, look for places on the map where the elevation lines (contours) are closely spaced. Closely spaced lines indicate rapid elevation changes. Steep mountainsides, high cliffs, and the walls of scenic canyons invariably show on the map as tightly spaced contour lines. When the lines bend into points along water courses, you’re likely to find dramatic pour-offs and creek beds filled with colorful boulders and interesting plants. Identifying ground features on a topographic map. Repeat visitors can profit from carrying a GPS. Have the GPS track your walks. Set annotated “waypoints” at places you see pictures you’d like to take when conditions are better. Take a few snapshots of the area and let your mapping software link them to the map to help you remember what you were looking at when you were there. Many smartphones have GPS sensors built in. Even if you are in a remote area without service, the phone will download the needed map when you get back to town. West Texas skies tend to be very bright, and the land is often igneous and dark – the range of light is too wide for any camera. Graduated neutral density filters tame the contrast and help you take great shots with colorful skies and properly exposed foregrounds in some situations. HDR, which stands for High Dynamic Range, is one of the most useful tools available to the digital photographer. Software generates HDR images by sandwiching three or more exposures and using the best parts of each. In the early days, results tended to be pretty tacky, but current technology allows you to take natural-looking photographs in even the most extreme conditions. Many cameras have the feature built in, and there are apps for smartphones that will do the trick. With older equipment you can simply bracket your photo and use Photoshop to generate the final image. This photograph would be impossible without HDR technology. In this photograph HDR enabled me to keep tones, detail, and color under control despite the subject being located at the bottom of a dark canyon with brilliantly lit walls and a bright winter sky over head. Closed Canyon is located in the Big Bend Ranch State Park near the River Road (SH 170). The canyon is narrow and deep shade envelopes parts of the channel. Above all, get out and enjoy the outdoors, away from the car and off the road. You’ll get better pictures and have better memories to take home from the trip. I don’t consciously pursue rare or endangered plants, but I live in an area where many of them reside, and are not only rare, but endemic. Here are three I’ve found simply because I like to hike out here. Yesterday I found the rare Cryptantha crassipes (Terlingua creek cat’s-eye) in bloom in an area near where the photo above was taken. I’ve been here many times, but I could never identify the plant. Here is a how Cryptantha crassipes usually looks. I once read that Cryptantha crassipes grows only at one spot on Terlingua Creek but, in fact, its range is somewhat greater than that. Michael Eason, in his new book Wildflowers of Texas, has the most accurate habitat description I’ve found. He says that it is “found only in Brewster County in a small area north of Terlingua and Study Butte, in extremely xeric conditions.” The landscape photo at the top of this page shows the area. The small blue-grey plants in the lower left corner are this plant. Yesterday there were at least three blossoms in an area of an acre or so where many of this species reside. When I started to photograph the flower, I found that a piece of the tripod was missing, so the image had to be taken hand-held. When this type of problem comes up, I usually just hold down the shutter release and take a dozen or more photos. One of them is bound to be in focus … right? Well, one of them was, and here it is. The flower is about three millimeters in diameter. This ringstem bears its flowers atop long, thin stems that seem to be locked in perpetual motion. However, once, just after a storm, there was a quiet moment and I was able to get this phone photo. I’ve seen Bushy Wild-buckwheat blooming only once. And once again, I had only a phone camera with me, so this is the only photo I have. Eriogonum suffruticosum is listed in Rare Plants of Texas (Poole, Carr, Price & Singhurst) despite its three county distribution. It is almost certainly a gypsophile and it is usually found with other gypsum loving/tolerating plants such as Tiquilia hispidissima, Acacia schottii, Amsonia longiflora and Eriogonum havardii. Older plants sometimes show a large “weathered” trunk with the leaves grouped in tufts at the ends. There are still many plants out here I haven’t identified yet, but the area has many surprises, and one can always hope for more blooms! One of the most surprising sights a hiker may encounter in the CD, must surely be the Osage Orange tree, Maclura pomifera, also known as Hedge Apple, Bois d’arc, or simply Bodark. An ungainly plant, the tree’s large, lustrous, waxy leaves mark it as anything but a desert tree. Nonetheless, they are here. Planted and cared for both by American tribes and Anglo settlers, the tree now probably resides in every state of the union. Growing from 10 to 66 feet high, the fast-growing Bodark tree produces the heaviest wood native to North America. It is also one of the hardest woods, (twice as hard as White Oak), and is listed as one of the 7 most durable woods in America. It is extremely strong, extremely elastic, and virtually impervious to insect attack and rot or decay of any kind. Its branches are protected by stout, sharp thorns, but its sap wood is the thinnest of any tree known. When young, the sapwood is a bright lemon-yellow. With age, it fades to a pale white. The heartwood is usually yellow with red streaks, or orange to dark-orange-brown. The wood takes an excellent polish, and has excellent dimensional stability. Long treasured and planted by early American tribes, European settlers did not discover it until the Lewis and Clark expedition. Their discovery of the tree has been called the most significant botanical discovery of the Lewis and Clark Expedition. When cuttings were sent to Thomas Jefferson, planting of Bodarks spread throughout the young nation. By the early 1800s the tree was being planted by settlers who had no wood and no rocks with which to fence crops and pastures. But the real planting started around 1850, when the Prairie Farmer began promoting Bodark for use as hedge fences. Tens of thousands of miles were planted in the 19th century. Without Bodark hedges, agricultural settlement of the prairies would not have been possible. The invention of barbed wire (which was a wire model of a Bodark branch) was cheaper to install and much cheaper to maintain than Bodark hedges, and soon became the fencing material of choice, but Bodark wood continued to be useful. Almost perfectly rot-resistant, and impervious to termites, Bodark became the primary wood used as fence posts, an application it still enjoys today. Planting resumed during the depression, when Bodark was planted as wind breaks. Within a few years of starting these programs, over 18,600 miles were planted. By 1949, the agriculture department reported that there were over 123,000 miles of these hedges. The hedges have other benefits – they reduce the numbers of insect pests, support 60% more pheasants and greatly improved populations of song birds. Today, Bodark is being planted for trash collecting around landfills. They are also being used as reclamation plantings on strip mines. Native tribes are known to have used Bodark wood for thousands of years. The Caddo were making bows of it as early as 1,000 AD. The wood was so valuable, tribes without access to it were willing to travel upwards of 100 miles to obtain it, and easily portable amounts of it could be traded for a horse, 3 or 4 beaver skins, and sometimes for more. Blackfoot Indians owned Bodark bows, even though they lived more than 1,000 miles from the nearest tree. The wood is extremely hard, heavy, tough, and durable and it makes excellent fence posts, insulator pins, treenails, furniture. Tool handles, pulley blocks, stair and porch rails, walking sticks, mine timbers, foundation blocks, railroad ties, grave markers, guitars, and pianos are other applications. Charles Goodnight designed and built the first chuckwagon, and he made it of Bodark so that it could withstand the heavy use it had over his vast land holdings. In 1899 the city of Dallas starting using it for pavement. It was considered superior to granite, because it did not hurt horses hooves. The wood continues to be used for building blocks; blocks over 60 years old have been unearthed in perfect condition and have been re-used for new structures. Since both native tribes and settlers planted Bodark almost anywhere they could, it now grows in every state of the union. Fossilized pollen from the plant 120,000 years old has been found as far north as Canada. But because of human planting activities, and because of the plant’s longevity (estimated at 200 years or more), its “original” range is probably impossible to determine with certainty. Today, that range is generally considered to be very small, and located in the Red River Valley. Surprisingly, many stands of Bodarks reside in the Chihuahuan Desert. Large trees such as cottonwood, willow, oak, and Bois d’arc grow within the South Fork of Alamo de Cesario Creek and Arroyo Segundo as well as other creek and canyon riparian zones. Trees near Bodark Springs in the Big Bend National park were probably planted by Commanche, but then we will never know for sure. There are 5 known Bodark sites in the national park. There is an isolated range of Bodark near Marathon, Texas, and we have now confirmed at least 3 sites where Bodark survives in the Big Bend Ranch State Park. These are located on the Leyva Creek system and the Lefthand Shutup in the Solitario, but others must surely exist in the many arroyos and canyons of the park. Casual hikers may never see this tree in our desert parks, but a few are there, and who knows? You may be the one to find the next ‘lost stand’ of the beautiful Osage Orange. The mineral gypsum appears all over the world, but is rarely seen on the surface anywhere except in deserts. Gypsum, is a form of Calcium Sulphate in which each CaSO4 molecule is chemically combined with two water molecules in a solid crystalline form. It is more soluble than most other minerals, so it tends to accumulate, and/or be exposed only in very dry environments where it may persist in the form of crusts, geologic layers, or scattered as tiny crystals in the soil. In moderate amounts, it provides plants with two vital nutrients — Calcium and Sulphur. Gypsum is widely used in agriculture as a fertilizer, a soil amendment, and sometimes in treating runoff from irrigated fields. But what is good in moderate amounts can become undesirable when present in high concentrations. High levels of calcium (Ca) and sulfur (S) can be toxic to many plants. Additionally, ion concentration in gypsic soils can be high enough to impede the osmotic flow of water into roots. Moreover, gypsum tends to be deposited on the soil surface where it forms hard surface crusts that prevent seedlings from becoming established. But as is often the case in nature, some plants have evolved an ability to tolerate gypsum, and a few have even evolved to require it. Those that tolerate gypsum are known as gypsovags; those that require it gypsophiles. Gypsovags are non-specialist plants that can live on gypsum soils when the physical crust is absent or reduced. They are often stress-tolerant refugees showing a limited ability to counteract the high S, Ca, and Mg concentrations in the soil; moreover, they are not particularly good at extracting the limited amounts of N and P that are available. Chemical analysis of their leaves reveals these weaknesses. But their ability to tolerate gypsic conditions gives them a significant evolutionary advantage over other plants competing in the area. Gypsophiles, on the other hand, are usually widespread and may even be dominant in the region they inhabit. These specialists can germinate on the physical crusts that typify gypsum-laden soils. In addition, they usually have physiological adjustments to help them cope with the chemical limitations imposed by gypsum soils. Many gypsophiles have succulent-like leaves that help them dilute undesirable ions. Others have specialized structures in the roots that block the uptake of undesirable ions. For example, the Mariposa cactus (Echinomastus mariposensis,) is so good at blocking gypsum uptake, gypsum may crystallize on its root surfaces. And many plants show adaptations similar to those used by salt-tolerant plants to sequester and/or excrete gypsum. Almost all gypsophiles are perennials and several generations of plants are frequently found growing together. Nevertheless, surprisingly little is actually known about gypsophiles. Few studies have been conducted on the subject (and most of those in Spain) and many studies present contradictory conclusions. DNA analysis is probably the most active area of research at present. Unexpectedly, DNA analysis tells us that each of the gypsophilic floras evolved independently from local plants; gypsum tolerance may well be a latent genetic trait of many of them. Moreover, it appears that some plants may have developed gypsophilic traits repeatedly throughout their evolutionary history. Not all plant families contain gypsophiles – in fact, most gypsophiles come from just a few plant clades. (A clade is a group of plants that are known to have descended from a common ancestor) and gypsophilic clades tend to contain mostly gypsophilic species. For example the Acleisanthes (trumpet flowers) clade contains 6 distinct groups of gypsophiles. The Namas (crinklemats) have 8 gypsophilic taxa. The Nerisyrenia (Mustards) clade has 11. Most true gypsophiles are not very good at distributing their seeds, so they often become isolated on gypsum outcroppings. There they may grow in great numbers but nowhere else. Plants that occur in numbers but that are limited in geographic scope are known as endemics; many endemic species are quite rare. For example, the newly identified Sophora gypsophyla var guadalupensis occurs only in the Guadalupe Mountains and in a single disjunct site in Chihuahua, Mexico. The past few years have yielded several new species that must be classified as gypsophiles. My own interest in gypsophilic plants began with the discovery of this little plant on the old government road in Fresno Canyon in the Big Bend Ranch State Park. The year was 2011. I couldn’t figure out what it was, and nobody else was able to do so from the photograph. But in 2015 I found one in much better condition and it was blooming! It turned out to be Anulocaulis leiosolenus, var lasianthus, or Chihuahuan Ringstem. This plant grows on the rocky gypsic soils found between Big Bend National Park and the Big Bend Ranch State Park. The area begins around Study Butte, includes the Terlingua Ghost town environs, and extends west to the western edge of the state park. Its north/south range is probably little more than 40 miles or so. This a classic rare, endemic, gypsophilic plant! Because of increasing desertification around the world, I believe we can expect to see increasing attention paid to this unique group of plants as we seek to understand how they deal with difficult environmental conditions. Back in 2009 I wrote a little article about lichen, those symbiotic organisms that have intrigued biologists for so long. At the time I wrote the piece, it was generally believed that lichen were usually a partnership of two species, a fungus and a bacteria, though some were known to have more than one bacteria in the group. It turns out that this is not true. You can easily see how this theory came to be so widely accepted by simply looking at a slice of lichen under a microscope. Here you can see the different organisms that cooperate to create a lichen. In this image you can see the photosynthesizing bacteria arranged just beneath the surface to catch the light, while the supporting fungus, here stained blue, lives below. The species pairings are usually quite specific; for each fungus there is one bacteria that will join with it to create a lichen. It would seem, therefore, that each unique pairing would produce a specific lichen. But this is not always the case – apparently different lichen are sometimes made of the same symbiotes. Moreover lichenologists who have attempted to combine two species known to coexist in real lichen, have not been able to graft the two species together to create a viable lichen. Why? The situation intrigued Dr. Tony Spiribille who has been studying lichen for over 15 years. He was particularly interested in two North American lichen which contain the same symbiotes, but which are different in several ways. Bryoria fremontii, sometimes called “Tree Hair Lichen” is a dull brown and looks like thick hair. Bryoria tortuosa is yellow or greenish yellow and has finer threads. Bryoria fremontii is is edible – Bryoria tortuosa is poisonous. Thinking that these two lichen must be different in some way, Dr. Spiribille sequenced their DNA. But DNA from the two lichen appeared to be genetically indistinguishable! Clearly a closer look was called for. Working with another group at the University of Montana, Dr. Spiribille used advanced sequencing technology to run RNA “deep scans” of the two lichen. Surprisingly, the RNA scan revealed the presence of a third species that was present in both lichens. Believing that his samples had somehow been contaminated he repeated the experiment, several times, but the third species always showed up. It is a species of Basidiomycetes fungus, previously unknown. He found that the Basidiomycetes fungus produces the substance that makes B. tormentosa so toxic. B. fremontii has the fungus, but very little of it, so it is safe to eat. Dr. Spiribille then asked other lichenologists around the world to look for the Basidiomycetes fungus. Amazingly, they found it in every lichen they examined – i It has now been found on every continent on earth. Moreover molecular evidence indicates that it has been part of lichen symbioses from the start of this partner’s evolution. Unnoticed for almost 150 years, this single species of fungus appears to play an important role in the lives of lichen everywhere. Dr. Spiribille’s remarkable discovery now points the way to a whole new area of research, one which we didn’t imagine just a few years ago. 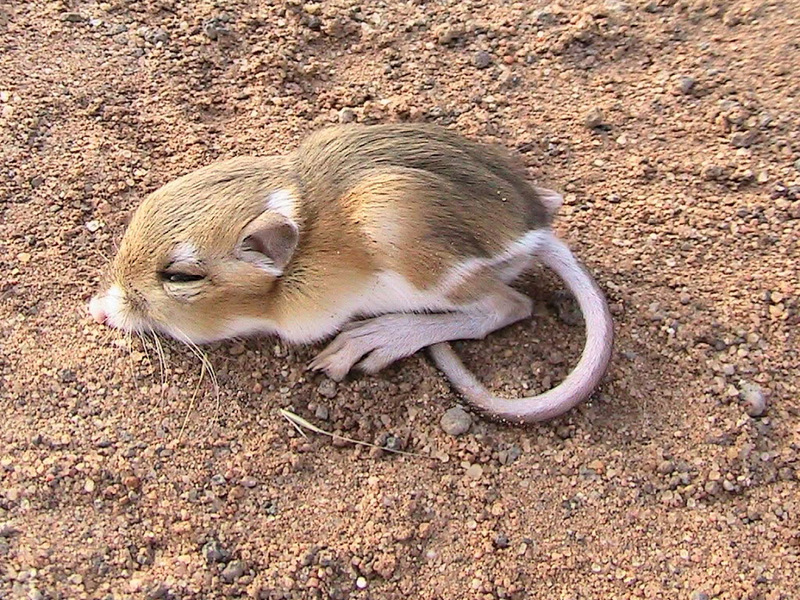 The Kangaroo Rat is one of the most remarkable animals in the desert. Neither a rat, nor a kangaroo, the Kangaroo Rat is in the genus Dipodomys and is closely related to mice and gophers, with whom they share the characteristic of having external cheek pouches. They are much larger than pocket mice, however, and can be differentiated by their strong hind feet and small, weak forefeet. All kangaroo rats have exceptionally long tails with a conspicuous white hip stripe running the length of the tail. When in a hurry, kangaroo rats hop, and they can hop very fast indeed – up to 12 miles per hour. 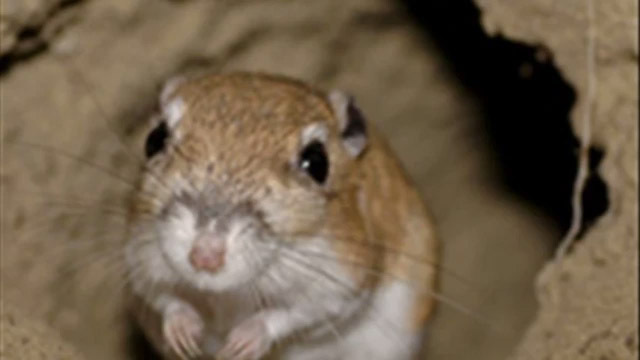 Kangaroo rats are certainly “cute.” But what makes them extraordinary is that they do not need to drink water – they can get all the water they need from their food. This approach would not be adequate if kangaroo rats were as profligate with water as other mammals, but kangaroo rats are masters of water conservation. They have several physiological adaptations that serve this end, and they actively behave in ways that contribute to conservation. Despite the high temperatures of their preferred habitats they have no sweat glands; instead they obtain all of their cooling through respiration. To do the cooling and keep as much water as possible, they have specially modified nasal cavities that act as condensers. As warm air leaves their lungs, it cools and the condensation that results is drawn back and readsorbed by their bodies. Their high body temperatures allow them to radiate heat more effectively than most animals, and although they have few sweat glands, those they do have are in their feet. The evaporating moisture therefore condenses on the floor of their burrows, and increases the humidity inside. Kangaroo rats have superb kidneys – probably the most advanced of any animal on earth. Their urine is between 4 and 5 times as concentrated as that of humans. It is almost solid when passed; salts and other metabolites may be concentrated as high as 24 percent, compared to 6 percent in humans. Kangaroo rats build extensive burrows which they use both as home and granary. They cope with daytime desert heat by remaining underground, and foraging above ground only at the coolest times of the night. In periods of extreme cold or low food intake, they can become torpid to reduce energy consumption. 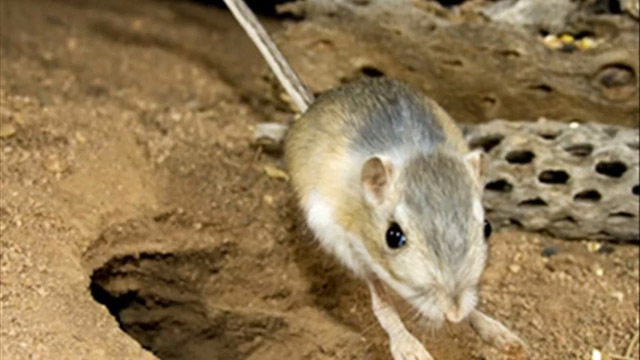 Kangaroo rats plug their burrows during the day and can maintain humidities near 50 percent or higher even while humidities outside may be as low as 5 to 15 percent. The moisture they exhale is then absorbed by the seeds they store, becoming available to them once again when eaten. They are selective in the seeds they gather and store, always taking the moistest seeds available – they are able to distinguish exceedingly small differences in water content. 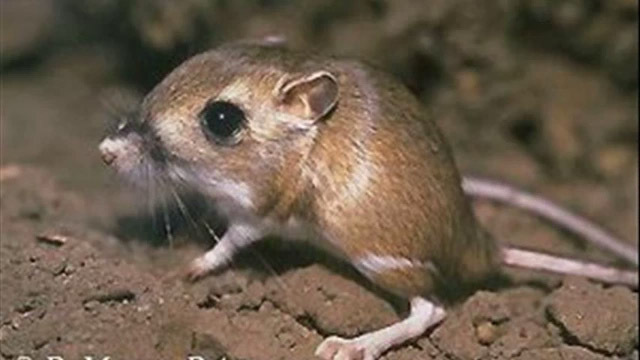 Early researchers thought the kangaroo rat’s diet contained mostly dry seeds. 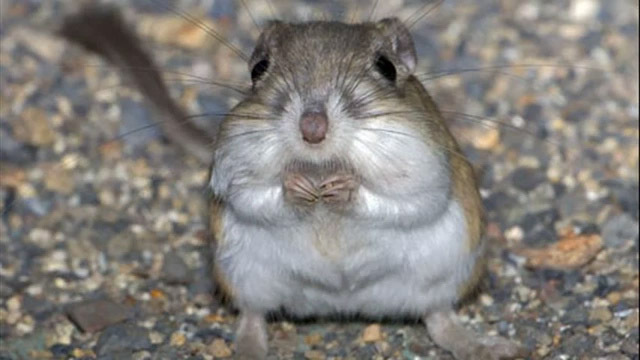 More recent studies that analyzed both cheek and stomach contents have revealed that kangaroo rats consume as many insects as they can, and are also fond of green vegetables. This is particularly true during breeding. In fact, when available, insects and green vegetation make up most of their diets. They also consume large quantities of creosote bush seeds along with cactus, mesquite, and the seeds of many wildflowers. Creosote seeds may make up as much as 37 percent of the food they carry back for storage putting the lie to the notion that nothing eats creosote! Though some researchers claim that kangaroo rats never drink water, that is not true. They can and do drink water when it’s needed and available. In captivity, kangaroo rats can be stressed to the point that they will even drink sea water – they are the only land animal known that can do that. These animals are rarely seen, but it is not really that hard to get a glimpse of one. I’ve been able to observe them by waiting near a burrow entrance, after dark (preferably on a night with little or no moon), with a small kerosene lantern. I’ve used peanuts and popcorn to lure them out (I break up the peanuts into small pieces). You have to remain very still as they have superb hearing, and activity outside the burrow may discourage them from coming out. But it’s definitely worth the wait. They really are adorable little creatures!